Do you have missing teeth and feel self-conscience about smiling? If so then you may want to consider a Dental Bridge. Barhill Dental Clinic offers a Dental Bridge service to help improve your teeth’s appearance and shape. Dental bridges are false teeth that are used to replace missing teeth. 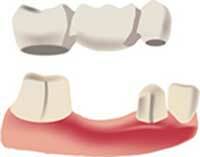 Unlike traditional removable dentures, a dental bridge is permanent. They are fitted by anchoring them to the teeth at one, or both, sides using metal bands, which are held in place by resin or cement. They are a cheaper alternative to dental implants for patients who don’t want to have surgery. They can help maintain the shape of your face. They can prevent your remaining teeth from drifting out of position. Bridges can help restore the ability to properly chew and speak. Bridges can help to restore your smile. What is the procedure for getting a Bridge? Generally, to prepare and fit a bridge will take approximately two visits. During the first visit the adjacent teeth are trimmed down slightly to accommodate their bridge. Next impressions are taken of the teeth where the bridge is going to be fitted. This is then sent off to the Dental Lab to be custom-made by a specialised lab technician according to the dentist’s instructions. As part of this first appointment, your dentist will also determine the right shade for your bridge and fit a temporary bridge until your new one is ready. At your second appointment, the temporary bridge is removed and the new one fitted. Your dentist will ensure that the fit is comfortable and that you are happy with the appearance. Multiple visits may be required to check the fit of the metal framework and bite. This is dependent on each individual’s case. After your Bridge has been fitted, if you notice and pain or have any sensitivity when you bite down, please contact your dentist. Usually this means that the crown is too high. This can be adjusted easily. You will also be given Oral Hygiene advice to help keep your remaining teeth clean and healthy. For further information, ask the dentist or speak to the receptionist by calling us on 01954 781616.